My wife jokes that baseball season never ends since there are baseball cards inserted in books all over our house. Yes, I use baseball (and occasionally hockey) cards as bookmarks. The cards are durable and occasionally even a bit informative when I want to take a short break from my book. 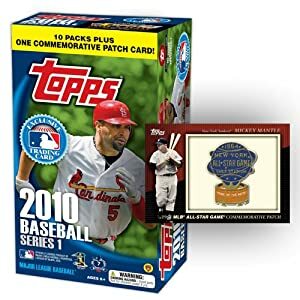 With baseball season beginning, I am giving away a 2010 Topps Series 1 Baseball MLB Factory Sealed Retail Box with Commemorative Patch Relic this week along with a $100 Threadless gift certificate (so you will have cool t-shirts to wear to the baseball games). To enter the contest, leave a comment in this post describing your favorite bookmark. The winner will be chosen randomly at midnight CT Friday evening (April 16th).